Order your own copy of the Downed AT-ST Battlefield Expansion at your local retailer or online through our website today! The Imperial All Terrain Scout Transport is a formidable war machine, cutting through Rebel lines as it stomps across the battlefields of the Galactic Civil War. Despite their appearance, however, these intimidating assault vehicles aren’t invincible. Soon you’ll find out what happens when one of these towering terrors comes crashing down. 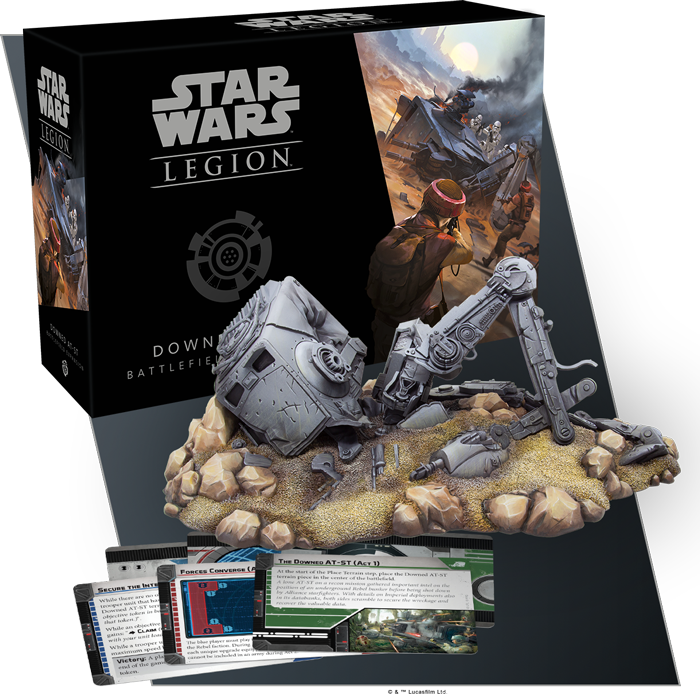 Fantasy Flight Games is proud to announce the Downed AT-ST Battlefield Expansion for Star Wars™: Legion! Rather than marching forward and raining mortar shells on the hapless Rebels in its path, the wrecked AT-ST you’ll find in this expansion joins the fabric of the battlefield itself, providing valuable cover for your troops no matter what planet they’re fighting on. In addition to deepening your immersion in the Star Wars galaxy, the six new battle cards in this expansion also invite you to make your crashed AT-ST a focal point of the struggle between the Empire and the Rebellion, adding even more variety to your games of Star Wars: Legion. From the tight back alleys of Mos Eisley spaceport to the lush forests of Endor, terrain forms the canvas for your Star Wars: Legion battles, affecting everything—from where you deploy your forces to the very strategies you employ once your troops are on the battlefield. With a finely detailed miniature representing an AT-ST that has crashed and crumpled into a rocky battlefield, the Downed AT-ST Battlefield Expansion can become an exciting and thematic centerpiece to any confrontation. A downed AT-ST is certain to draw the attention of both Rebel and Imperial troops, of course, and while this miniature can enhance any battlefield you find yourself on, it can also play a larger role as a crucial objective in a totally new type of conflict. 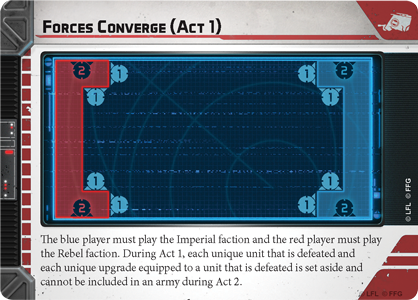 The Downed AT-ST Battlefield Expansion contains six new battle cards that dramatize a two-act struggle over a wrecked AT-ST, outlining the objectives, deployments, and conditions of a brand-new, two-part scenario. As the scenario opens, a lone AT-ST on a recon mission has gathered important intel on the location of an underground Rebel bunker before being shot down by Alliance starfighters. 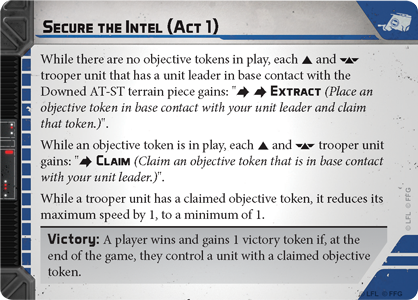 Desperate to Secure the Intel , the first act sees both players racing toward the downed AT-ST to extract this crucial information before it can fall into enemy hands. But as Forces Converge on the crash site, this confrontation is sure to escalate quickly. As it does, the weight of your choices can be felt throughout your army, as each unique unit that is defeated in Act 1 and each unique upgrade equipped to a defeated unit in Act 1 becomes unavailable to you during Act 2. 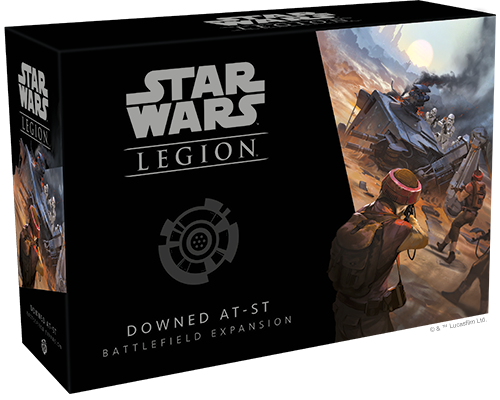 Between the beautiful downed AT-ST miniature itself and six new battle cards, the Downed AT-ST Battlefield Expansion alters the landscape of your games of Star Wars: Legion while opening up an epic new way to play. Even without the use of its powerful MS-4 Twin Blaster Cannons and other heavy weapons, an AT-ST can still play a pivotal role in the confrontations between the Empire and the Rebellion—especially if it’s a part of the battlefield itself. Look for the Downed AT-ST Battlefield Expansion (SWL30) to be released in the second quarter of 2019! You can pre-order your copy at your local retailer or online through our website here.